Are you passionate about food and nutrition security or have an interest in agricultural research and development? Would you like to explore opportunities for related careers, research, volunteering or employment? Are you under 35yo and in Victoria, Tasmania, WA, SA, ACT or NSW? We have an opportunity for you! The Crawford Fund has launched its conference scholarships as part of its efforts to encourage young people in their study, careers and volunteering in international agricultural research. You are strongly encouraged to seek out this opportunity to attend our annual conference in Canberra and experience two half days of activities including mentoring and learning about opportunities in agriculture for development. Former scholars are overwhelmingly positive about their conference scholarship experience, seeing it as an invaluable mentoring, networking and motivational experience in the field of agricultural development. “Mentoring and networking was exemplary, highly enriching and rewarding,” Samuel Ariong, NSW scholar. “I left Canberra feeling like I had made leaps in my knowledge of research opportunities overseas, agricultural research targeted to development and developed a strong and invaluable network of esteemed researchers,” Maddison Clonan, NT scholar. “I think the most valuable part of the conference was the scholar days. It was an excellent opportunity to get advice from people in a range of positions with different experiences. We heard everything from broad motivational career advice to specific recommendations on how to network and apply for jobs,” Sarah Sutcliffe, QLD scholar. “The best thing, and rather quite unique one, in this conference was the idea of mentorship…I liked this idea a lot, as this not only provided a focused and quick learning environment but also the opportunity of networking through your mentor,” Salman Sarwar, QLD scholar. The positive feedback we received from last year’s Scholars is available here. 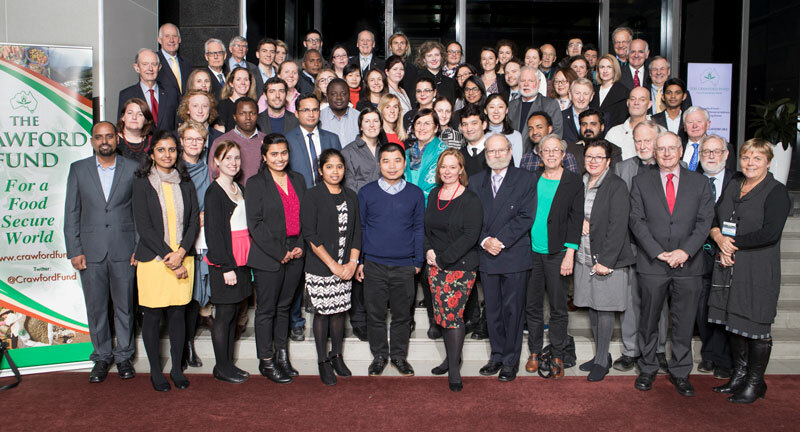 The scholars are involved in two ½ days of activities in addition to the conference; engage with keynote speakers, experienced Australian agricultural researchers and educators, and other passionate young people who have experience overseas in developing countries as researchers, volunteers or mentors. The scholarships are awarded through our State and Territory programs, with conference registration fees and reasonable transport, food and accommodation costs covered by the award. Our conference this year runs over 13 and 14 August in Canberra and is titled “Reshaping Agriculture for Better Nutrition – The Agriculture, Food, Nutrition, Health Nexus”. Currently there are still 815 million people chronically undernourished. Simultaneously, the number of obese people has reached approximately 1 billion. This key national food security event will ask: “how can we feed and nourish the world’s increasing population with a diet that promotes good health and at the same time minimises further environmental impact? Dr Alessandro Demaio, CEO of the Eat Foundation is perhaps better known in Australia as co-host of the ABC television show Ask the Doctor or for his recent Business for Peace discussion with celebrity chef Jamie Oliver. He will be joined by others including Dr Jessica Fanzo, Co-chair of the Global Nutrition Report from John Hopkins; Professor Glenn Denning from the Earth Institute and Colombia University; Dr Marco Wopereis, Director General, World Vegetable Center; Dr Andrew Campbell, CEO, Australian Centre for International Agricultural Research, and a range of researchers presenting case studies of impact for nutrition security in PNG, Timor Leste, East Africa and Bangladesh. Applications or questions can be directed to the Crawford Fund Coordinator for your State/Territory.